Pause. “Dad?” asks Jenna. “Yes, baby,” he replies. “Are you mad?” she inquires. Sadly Ellen probably wasn’t expecting to talk to the President of the United States, or else maybe she could have put him on the spot about gay rights – now THAT would have been some television. 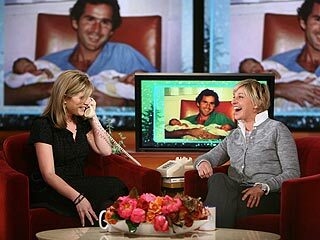 Awww, this would have been so much more fun with a pre-strike Ellen, before she became a public enemy of the writers.